Injury Updates and Three Roster Moves. Two Down, One Up. · Let's Go Amerks! Injury Updates and Three Roster Moves. Two Down, One Up. 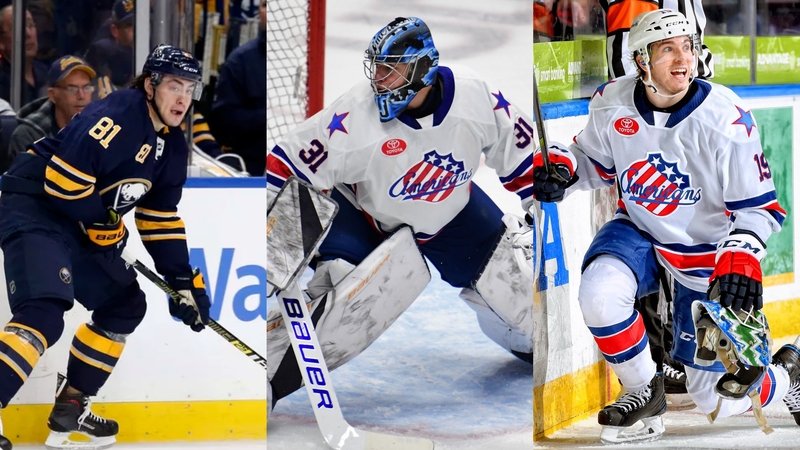 It’s been an active few days for the Rochester Americans roster with one player going up and two players going down. There’s also good news on the injury front with one player returning and another closer than expected. Remi Elie was sent down to Rochester from the Buffalo Sabres after clearing waivers. In only 16 games played with Buffalo this season he had one assist. The Sabres had claimed him off of waivers in early October as they were dealing with injuries. Elie doesn’t count against any veteran spots on the Amerks roster and brings some valuable Calder Cup playoff experience to the team. He played in 19 playoff games last season with the Texas Stars making it to the Calder Cup finals. Once Elie cleared waivers and was assigned to Rochester it opened up a roster spot for someone to get called up. Elie practice with the Amerks on Monday. CJ Smith is the player that was called up by the Buffalo Sabres and depending on how he plays and the Sabres do there’s a chance we may not see him back in Rochester until sometime in the playoffs. The sometime in the playoffs part is dependent on what the Sabres do. When CJ Smith was assigned back after his first call up he immediately scored a hat trick against Toronto. He also had had a point in seven of eight games since finishing with 12 points (5G+7A). Jonas Johansson was assigned back to Cincinnati after appearing in two games with Rochester and earning two wins. A shootout win against Utica and regulation win against Hartford. There’s a good chance we’ll see Johansson back in Rochester again this season. Scott Wedgewood is cleared to play and is returning from a short injury after being out for almost two weeks and missed four games. Even without the number one goalie the team was 3-0-1-0 in those games with the only loss in overtime against Syracuse. Wayne Simpson ended his iron man streak at 231 consecutive games played when he sat out this past Saturday in Hartford. He’s skating this week as an extra and is day to day. Simpson started his 231 game stretch on January 29, 2016 playing with the Portland Pirates. Continued through 76 games with Providence, 76 with Hershey, and 44 this season with Rochester. Andrew Oglevie has returned to team practices for the first time since November and is in a no contact jersey. He had left the game on November 30 with a concussion and wasn’t involved with any on ice team practices since. He had been skating on his own until now. He’s not expected back in the lineup for a couple weeks as he gets back into game shape. He had only played in 14 games at the start of the season and scored one goal. In his last season at Notre Dame he finished with 39 points (15G+24A) in 36 games. Zach Redmond is on the day to day list instead of week to week which is great news. He’s been out for almost two weeks as well. The last game he played was January 23, the same game that Wedgewood went out with an injury from. The lower body injury wasn’t as bad as it could’ve been and the team is hoping he’ll be ready soon. He hasn’t returned to skating with the team yet. Sean Malone is still week to week and hasn’t started skating yet. Taylor Leier is good to go on Wednesday. He sat out the two weekend games with an illness. For the latest updates follow @LetsGoAmerks on Twitter!